It is that time of year again, in which we reflect on the choices we have made and the choices we will make. Unless, you are me, in which case this time of year means one thing and one thing only — reflecting on music. In terms of releases, this was hip-hop’s year, while pop, rock and pretty much all other genres struggled in terms of commercial releases. That does not, however, mean that there were no stand-out projects. In fact, this year boasted some of my favorite albums of all time. So, without further adieu, here are my top 10 favorite albums of the year. I will try my hardest to make this list a tad less humiliating than last year’s, because to be perfectly honest… I was going through a music taste crisis. I have truthfully never listened to a Paramore album that I have enjoyed until this project. Not only did the band, fronted by lead singer Hayley Williams, return with an addictively poppy lead single (“Hard Times”), but they also managed to deliver a whole album filled with the same addictive, vintage pop tropes. All of this coming from a notorious pop punk band with a history of cliche music schemes makes it easy to see why this album made it onto my list. This year I became infatuated with the underground hip-hop seen. During my album binges, I stumbled across a group known as Injury Reserve. The trio — made up of rappers Ritchie with a T and Stepa J. Groggs and producer Parker Corey — have created two great albums filled to the brim with bass-bumping, body-rolling rap bangers that are just begging to be played through the aux in your car. The group expands upon this in their new project, an EP titled Drive It Like It’s Stolen, which takes a softer side while maintaining an aggressive approach. I am looking forward to what Injury Reserve has in store for the 2018 year. I never in my life thought that I would enjoy an album written by a member of One Direction. And, yet, after breaking up, former One Directioner Harry Styles seems to be the only member to take both a mature and successful approach to his solo music. Think Elton John meets Paul McCartney meets, well, Harry Styles. This album is equal parts conceptual and replayable, as each and every song has its own unique melody and odd little quirk that sets it off from the rest. You know what? I’ll be right back… I’m going to go buy a One Direction T-shirt. Once again, this album came as a complete shock to me in the sense that I did not expect to enjoy it in the slightest. I have always found Migos’ style to be rather brash and moronic, never truly sticking out to me as something I would actively listen on a regular basis. Alas, this all changed the day I heard the debut single for this album “Bad and Boujee.” Not only did this song have an exceptional verse from Offset (and a rather memeable one from Lil Uzi Vert), but it paved the way for what would be an album seasoned with the exact same pop-rap confections that made the single so addictive in the first place. Sidenote: 2018 has arrived, and with it, so has Culture II… It really is true that the sequel is always, always worse. This album came to me the same way that Injury Reserve’s EP did — through an underground hip hop album binge. i have listened to this album start to finish at least three times, and with every listen, I grow more and more fond of Mike’s ability to fuse exceptional prose with idiosyncratic social commentary. This is Open Mike Eagle’s most personal album to date, and I commend him on his successful risk taking. As overrated as I think this album is, I can not deny that I still enjoy it a great deal. As i have noted to my peers several times, Kendrick Lamar is to now what Andre 3000 was to 2010, always managing to find rhyme schemes and patterns not yet to delivered to the listener’s ear and making of it a hit that not only reaches hip hop lovers, but music lovers everywhere. This was by no means Kendrick’s best project, but it was still one of my favorites and will most definitely be remembered in music history. Don’t believe me? Talk to the five Grammy awards that it won. To be perfectly candid, not too many people could cheat on Beyonce, undergo a whole album’s worth of criticisms (i.e. Lemonade), and still return to the music scene with his head held high. And, yet, JAY-Z did just that with 4:44, an album confessing his adulterous behavior and many more laudable topics (his mother’s coming out as lesbian, for example). This is the first JAY-Z album I have listened to more than once, and if more music like this trails behind, it certainly will not be the last time. And a big fat UN-honorable mention to the Chainsmokers for their God-awful album Memories… Do Not Open. I have never really been able to get behind a Vince Staples record before this one. I had heard about him through the Odd Future collective, but as far as actually enjoying a solo project, I had never really been 100 percent on board. At its core, this album is everything previous Vince Staples albums needed to be. It is equal parts experimental and warped, cutting through the quiet and discussing issues such as racism and depression in a blunt-force type of manner. Its production is reminiscent of Danny Brown’s Atrocity Exhibition and yet lives on as its own independent entity. While some critics found the project to be disorganized and overproduced, I found it to be a balanced masterpiece and Vince Staples’ best album to date. I quite literally flipped a coin to decide my number one and two spots, so here we go. In the runner-up spot is an album that is actually not an album at all… but rather, three of them. I initially decided to group BROCKHAMPTON’s three albums (SATURATION I, II, and III) into one specific project because, well, at the end of the day, this whole record is one cohesive masterpiece. BROCKHAMPTON broke into the music scene in early 2017 with singles “STAR,” “GOLD,” “FACE,” and “HEAT,” immediately captivating me with their diverse performances. Not only are there 13-plus members, but they are all equal parts gay, straight, black, white and so much more. This group is a symbolization of what the world needs to be like… and I suppose their incredible music is an added bonus. This album is equal parts cinematic gold and musical euphoria. i have been a fan of Tyler for as long as i have liked hip hop, and not only is this the most mature album Tyler has produced, it is also his most aesthetically pleasing. Focusing on jazzy elements (with the occasional bass rattler), Tyler spins an album that belongs as the soundtrack to an indie movie. Focusing on loneliness, materialism and sexuality, he allows himself to bloom (an apparent theme in this album) into a rapper that has now been Grammy nominated. Inspiration from artists such as Pharrell Williams and Roy Ayers pour from this compilation of vibrant colors only expressible through listening to it for yourself. This album reminded me why I love Tyler the way I do. 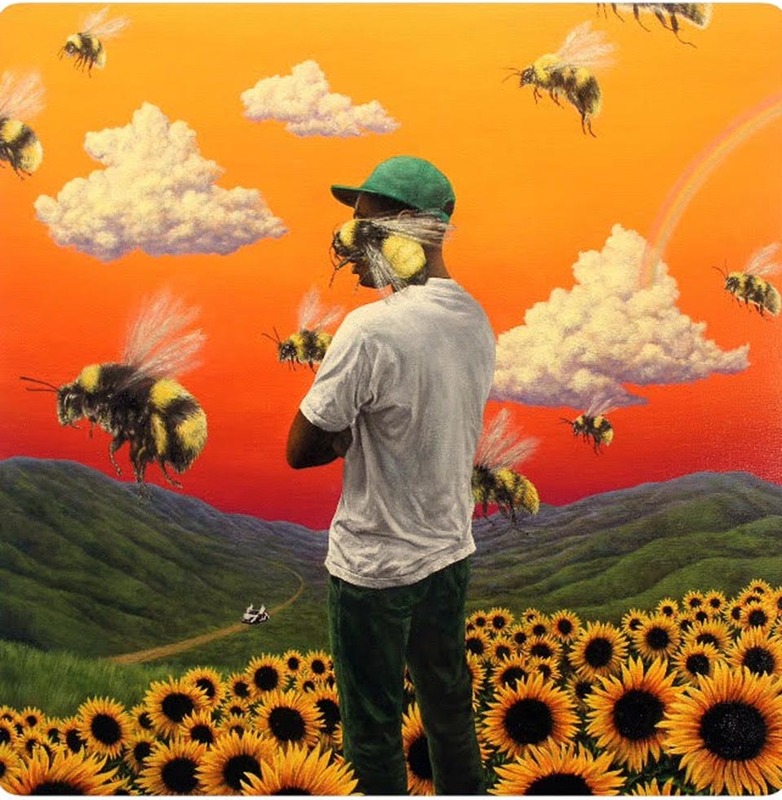 If you need to feel inspired, understood, or even just have something to listen to, Flower Boy is the album for you. It transcends hip hop and becomes its own living, breathing organism. And, it is most definitely my favorite of the year.